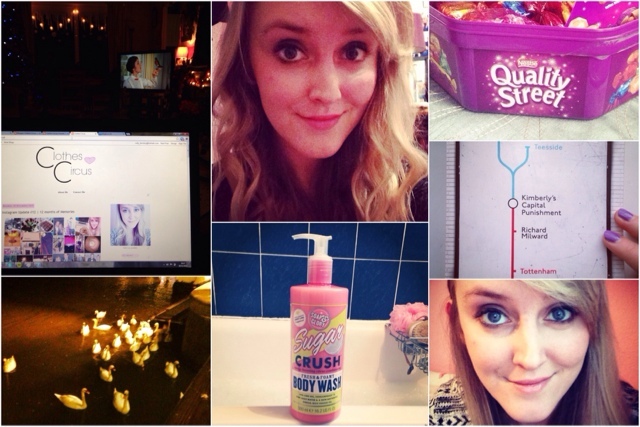 Here is a little round-up of what I've got up to this week - my 13th week of the Instagram Update. Highlights include New Year's Eve and going to a cocktail bar for a friend's birthday. I had time off for New Year, which was amazing considering I had to work over Christmas. I didn't get much done on my days off but I did get to see my boyfriend quite a bit before he goes back to uni. We celebrated the New Year together by going to a couple of pubs. I always think New Year is overrated - I'd much prefer a quiet night than a big blow out because there's so much pressure for it to be a good night! I used my Urban Decay Naked 3 palette for the first time last week! Wow, it is amazing! I'm wearing some of the colours on both of the photos of me. It's by far the favourite bit of make-up I own and will definitely be featuring on my favourites of 2013 blog post (look out for that). I had a lovely evening for a friend's birthday - it was at a cocktail bar and I had far too many cocktails. I really enjoyed myself though, and it was nice to catch up with people I knew at university. I had a hangover yesterday but it was nothing a roast dinner and a nap couldn't cure.